Shopping for a wireless router can be a bit of a gamblet at times; every last one promises you the world, and problems can crop up with alarming frequency. Shopping for a wireless router with a small budget is an even riskier proposition, as manufacturers tend to cut corners to drive down their costs. 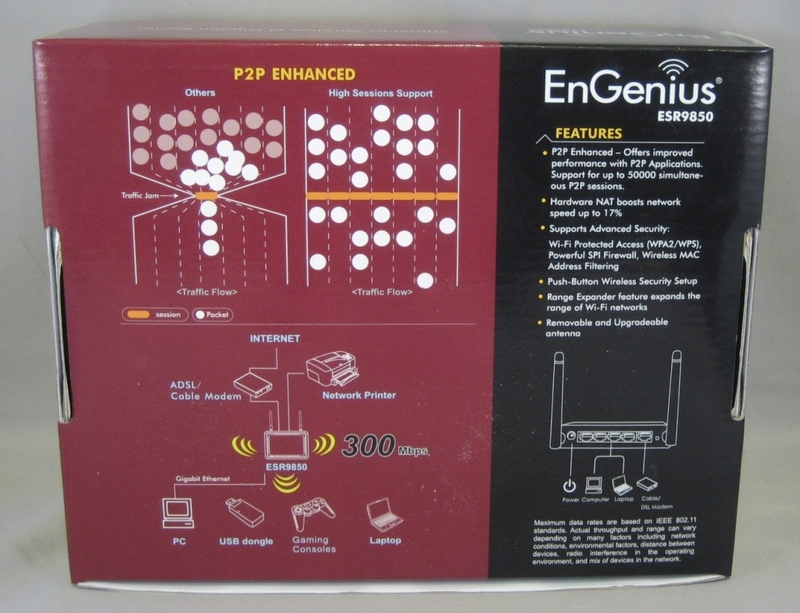 Wading into this sea of uncertainty is a relatively unknown manufactuer, EnGenius. 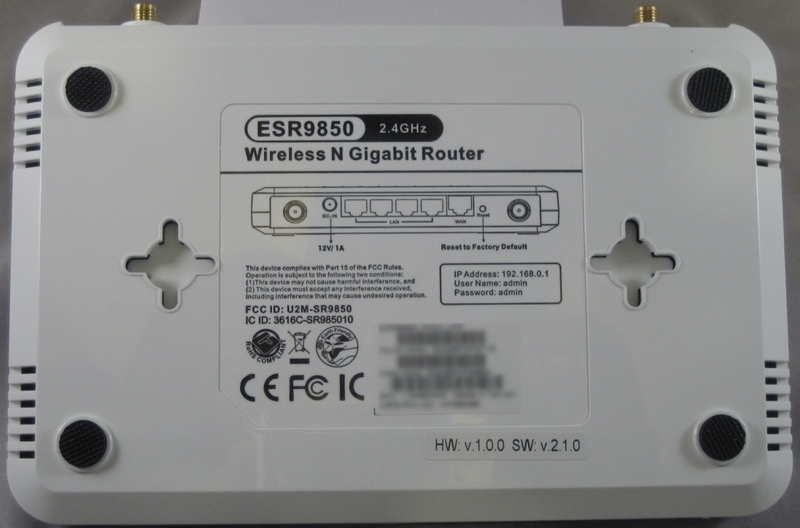 Their history is more with telephony than with networking gear, but this latest router they’ve sent us, the ESR-9850, shows some promise. Let’s see if it can hold up when it counts. So far, so standard. 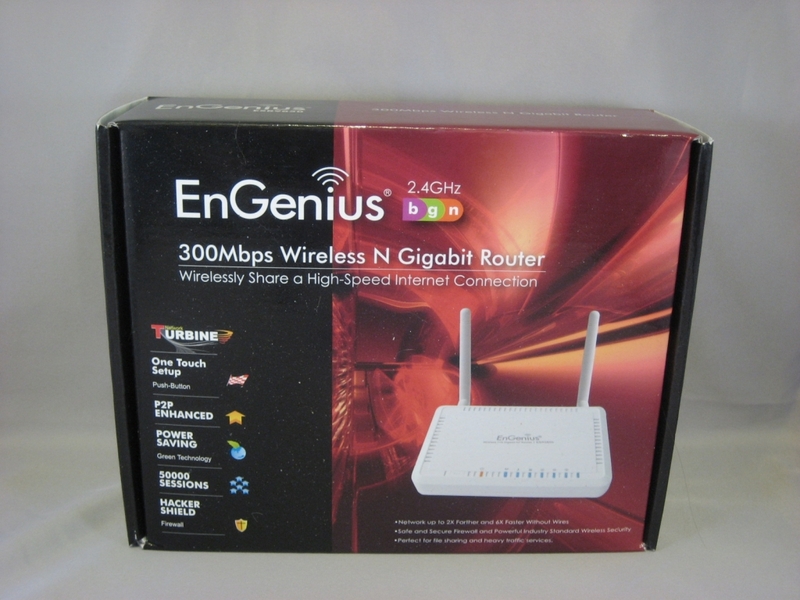 The key phrases to pay attention to here are “2.4GHz”, “300Mbps Wireless N” and “Gigabit Router”. “50000 Sessions” is also interesting. The back expands upon the features touted on the front. The advertised support for 50,000 simultaneous connections should be a boon for anyone who regularly uses BitTorrent or similar P2P software. Opening the box up, we see what has become an increasingly common sight with consumer hardware: a setup CD and a scrap of paper with the bare minimum instructions to get said CD running. 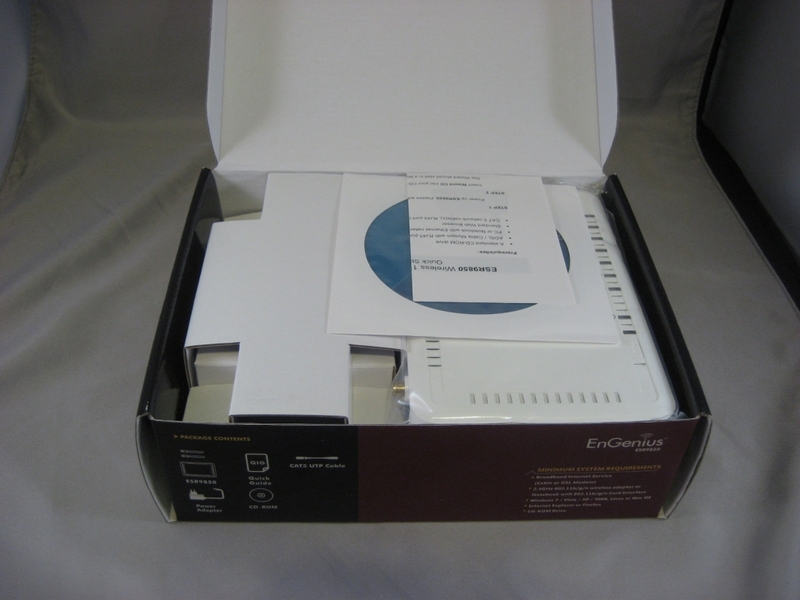 Under those, we see the router itself, wrapped in a plastic bag and wedged into place with a cardboard insert, which also contains the other accessories. Clearing away the packaging, we are left with the router itself, an AC adapter, a short straight-through Cat5e patch cable, two screw-on antennas, and a pair of screws and drywall anchors for wall-mounting the router. 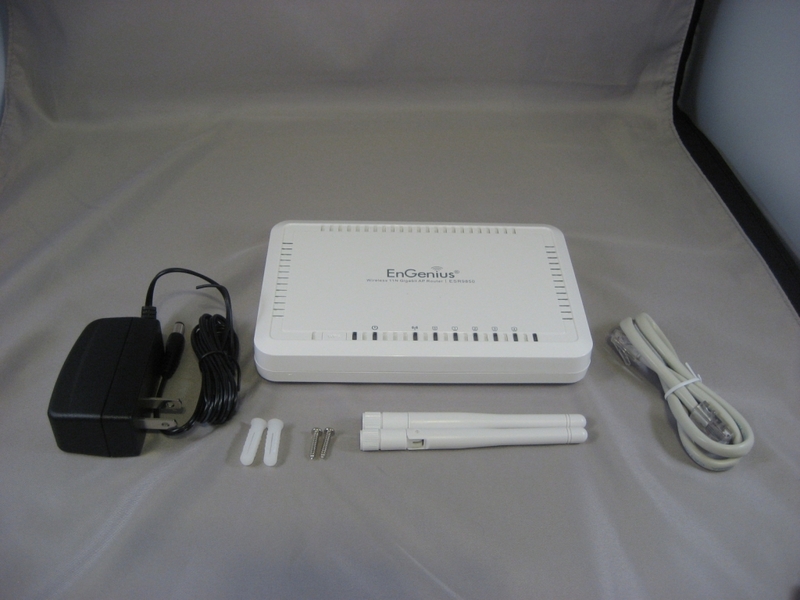 On the router itself, we see a number of status lights across the top front, as well as a recessed button for activating WPS synchronization. More on that later. With a device like this, all the interesting bits are in the back. Flanking the ports on either side are a pair of antenna posts. 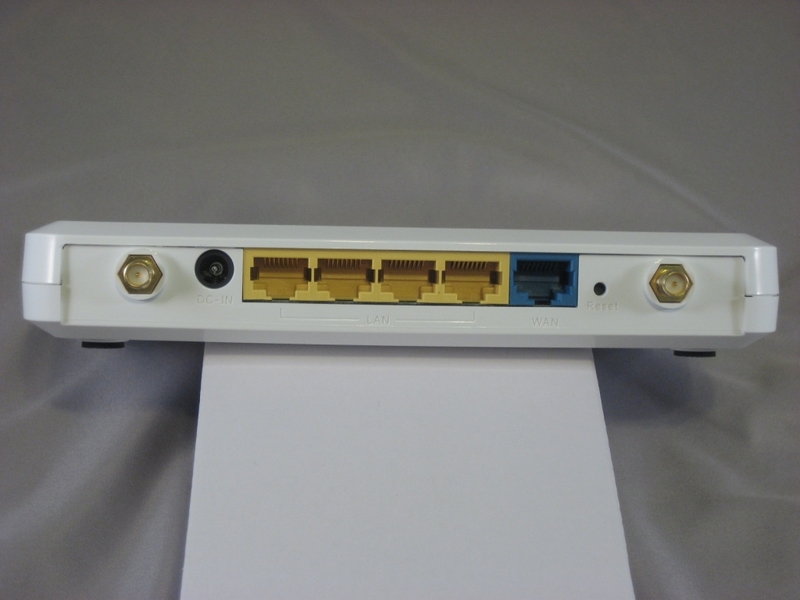 Since these are standard SMA connectors, those in more challenging radio environments could opt to ditch the included antennas in favor of larger, higher-gain ones. Aside from that, we have the power plug, a reset button, and five Gigabit Ethernet ports, four for LAN and one for the WAN uplink. In an unusually helpful gesture, EnGenius has color-coded each group, making it easier to tell at a glance which is which. On bottom, we see both the wall-mount notches in the case and a sticker that gives you all the basic info you need to get the router up and configured including default router IP, user name and password. The blurred-out portion contains the router’s serial number and MAC address, which I don’t want to broadcast to the world for obvious reasons.